Ensemble Theatre is one of my favorite places. Not just one of my favorite theatres (it is definitely) but its one of my favorite PLACES. There’s just good energy inside and almost everyone who works there always seems happy to see the regular patrons and other friends of the place. And of course they do, given that their leader, Lynn Myers, is quite possibly the warmest, most genuine “good soul” around. And every year this theatre takes a break from heart-wrenching, socially probing, and sometimes difficult to swallow plays to present a non-denominational, family friendly musical. It’s quite quaint and knowing how many children see the show for free through the Fairy Godmother program makes my heart tingle. CINDERELLA is this year’s offering; its one of the better ones. The traditional story arc is there but Joe McDonough (with lyrics by David Kisor) has tinkered with the book a little. 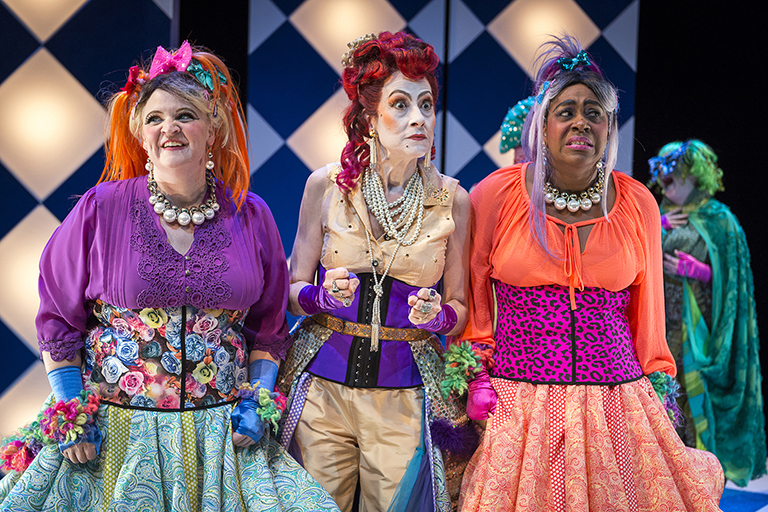 To its benefit, the show is accented by wild costumes (by Rebecca Senske), a duo of hilarious step sisters, and a couple of pairs of sneakers. Brooke Steele plays the title character and she excels here. The structure and tone of the show allows her to be over-the-top. Her vocals are the best of the bunch and I found myself rooting for her. I also rooted for Warren Bryson’s “Prince Freddie.” He is a handsome prince, but doesn’t quite know it. They have nice chemistry together. The usual suspects are here, too. Kate Wilford is her usual glowing sweetheart. Deb Girdler is restrained but brings a sense of sinister to her Brunhilda, the step mother. Michael Bath as King Frederick has some great one liners and Darnell Pierre Benjamin moves his lanky legs around the stage coupled with a very funny French accent. But the real stars of the show are Sara Mackie and Tori Wiggins. Just like their characters, you get a sense that these two actresses are subtly looking to one up one another – amping up the comedy as they go – and the audience benefits from it. They had me laughing out loud more than once. I will say that I found some of the vocals almost cringe-worthy and Fitz Patton doesn’t give us one hummable tune in the 100 minute run time. Dee Ann Bryll does her best to choreograph the hook-less tracks and, as usual, simplifies the movement of the ensemble in a way that doesn’t distract. But, in spite of these minor weaknesses, there is a sweetness that will go unmatched across this holiday season’s theatre offerings. And I don’t know about you – but with all the darkness in the world today . . . I need a little more of that. CINDERELLA runs through January 3rd at Ensemble Theatre in Cincinnati. It’s appropriate for all reasonable ages. Tickets and more information can be found here.